It is a fairly common perception that, when comparing terminal emulation software, all products are roughly identical. They all talk to the host, right? They all offer SSL and SSH connectivity, right? So, how much difference can there be? As it turns out, there is – or can be – quite a bit of difference. OutsideView 8.1 offers a number of unique capabilities. In this article, we will focus on that uniqueness in only one functional area – that of software and user administration. OutsideView offers a group of related options under the name “Enterprise Mode” that has capabilities unmatched by any competing product. Unlimited Installations – In the Enterprise mode, end-user licensing is handled through a dynamic ‘pool.’ Since the number of licenses in the pool defines the number of simultaneous users, there is no limit on the number of instances/locations where the OutsideView software can be installed. Concurrent licensing – With concurrent licensing, an end-use workstation consumes a license only while actively using OutsideView. When OutsideView terminates, the license is released. Now you need purchase only enough licenses to handle your high-water simultaneous usage level, you don’t need a license for every potential user, active or not. Automatic Configuration Synchronization – Administrators can create, or modify, host connection configuration files – in a single central location – and know all end users will automatically acquire those new or changed files upon next OutsideView start. No ‘push’ is needed. 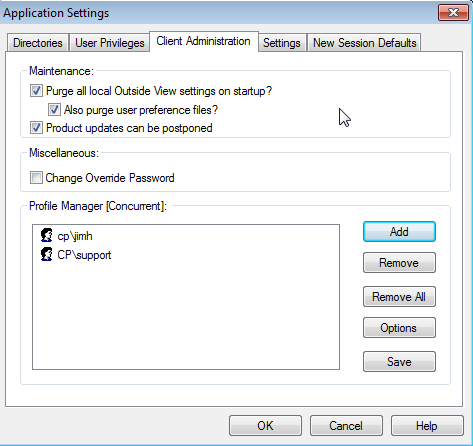 Multiple Profiles – Users can be assigned, by Windows User or Group name, to profiles, and each profile can contain a unique blend of user permissions, and configuration files. Roaming Profiles – An end-user’s membership in a profile can be dynamically determined, based on Windows username or Group membership. So, wherever a user signs in, they will still associate with the proper profile, and that profile’s configurations, and that profile’s permissions. Illustration 1: Assigning roaming profile membership via Windows User Name or Group membership. Automatic Updates – When a new maintenance update comes out, copying two files to the Enterprise central location will cause all end-use copies of OutsideView to automatically update. Again, no ‘push’ needed. User Permissions Matrix – Each profile can be assigned different user permissions. These can range from Unlimited (users can create/change configuration files of their own), to Selective (users can only use configuration files provided via synchronization with the central profile – but can locally modify selected settings, such as colors, within those files, to Limited (users can only use configuration files provided via synchronization, and must use them ‘as supplied’ without local tweaking). Illustration 2: A single dialog lets you set permissions for a profile (group of users). Here, user rights to modify some settings, but not others, are being defined. Lockdown mode – Lockdown mode is expressly designed for environments needing maximum user oversight. 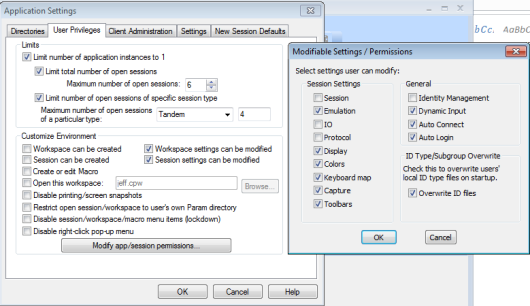 In this mode, users can open one, and only one, workspace, containing only those sessions you define. Typically that will be one session that immediately attaches to a given service (application). Users can operate the application but do nothing else. They have no menu options other than Help or Exit. Screen prints are disabled. Automatic Failover – The central Enterprise location can be replicated in a secondary location, with automatic failover and failback in the event the first location is unavailable for any reason. LicenseView Utility – LicenseView lets OutsideView administrators view how many licenses are in use at a given moment, which licenses are in which by which users, assign or free licenses, etc. Illustration 3: The LicenseView utility lets you see how many licenses are in use, and by whom. If you have any additional questions, please contact our Support team by email support@crystalpoint.com or phone 1-425-806-1143.